We don't have any trips to Iran at the moment . Situated on the picturesque Persian Gulf and with a history dated back to ancient times, Iran evokes the senses in several ways, through the seemingly limitless beauty of its architecture, the rich cultural heritage, and it's varied landscapes and vistas. When visiting Iran, expect to be transported back in time to Ancient Persia as you stroll through the ancient city of Persepolis or look up in awe at the minarets of Naqsh-e Jahan Square in Isfahan. The people of Iran are famed for their hospitality, even in the bustling capital of Tehran, and this fact is another reason to make sure this country is on your list of top destinations to visit. The weather is particularly varied, with a comfortably warm high season and a cold winter, so whatever time of year you choose to visit you will be rewarded with a unique discovery. Outdoor enthusiasts are spoilt for choice when it comes to Iran: desert landscapes interspersed with rocky mountains and idyllic beaches provide the kind of variety to make a trip to Iran a well-rounded experience. Lovers of the arts will feel most at home in Shiraz, a hot-bed of poetry, literature, and art, whereas Tehran is a delightfully lively city with up-market shopping streets and a plethora of restaurants to suit all tastes. Your passport must be valid for a minimum period of 6 months from the date a visa application for Iran is submitted. Passports must not have Israeli stamps. Visa required. The supplier will issue you with an invitation letter for your visa. No vaccines required. Check with your doctor before travel. You can not pay or withdraw money at ATMs with any credit or debit card that is not Iranian. 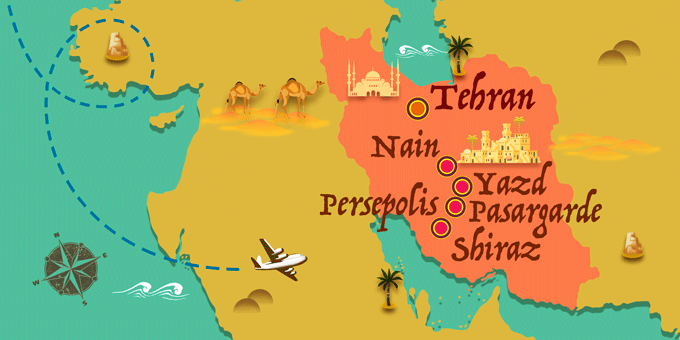 If Iran has caught your attention, leave us your number so we can call you to discuss the voyage that awaits you.